The Fujifilm X-H1 is a new flagship compact system camera sitting at the top of the Fujifilm range above the X-T2 and X-Pro2 models. The XH1 is the first ever Fujifilm camera to feature in-body image stabilization (IBIS), which offers a maximum of 5.5 stops of compensation depending on the lens that you're using. Improvements on the video side include a new film simulation called Eterna that's ideal for shooting movies plus a new F-log video mode, DCI 4K and 1080/120P high-speed support, plus 200Mbps high bit-rate recording. It also has a 24 megapixel X-Trans III APS-C sized sensor, X Processor Pro image processing engine, 3.69m dot electronic viewfinder, 1.04m dot three-direction tilting LCD screen with additional touchscreen functionality, a 25% tougher weather-resistant body, 14fps continuous shooting, a focal plane shutter with a top speed of 1/8000 sec. and flash sync up to 1/250 sec., silent electronic shutter with a maximum speed of 1/32,000 sec, flicker reduction mode, 91 auto-focus points (expandable to 325), improved -1EV AF range, a more sensitive shutter release button, a sub LCD monitor on the top plate, and support for dual SD memory cards. The Fujifilm X-H1 costs £1699 / $1899 body-only or £1949 / $2199 with the new VPB-XH1 vertical battery grip. 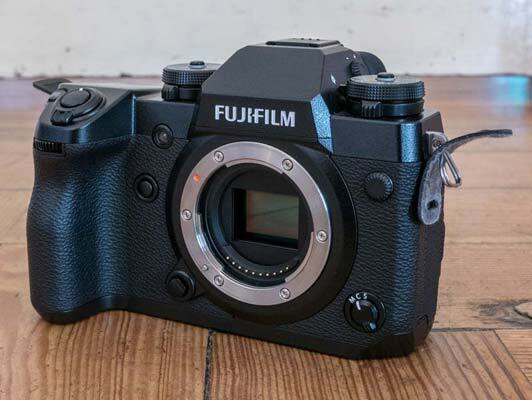 In terms of its overall design, the Fujifilm X-H1 shares the same DSLR-like format that has proved so popular on the X-T2, but the XH1 is both bigger and heavier than both the XT2 and XPro2. 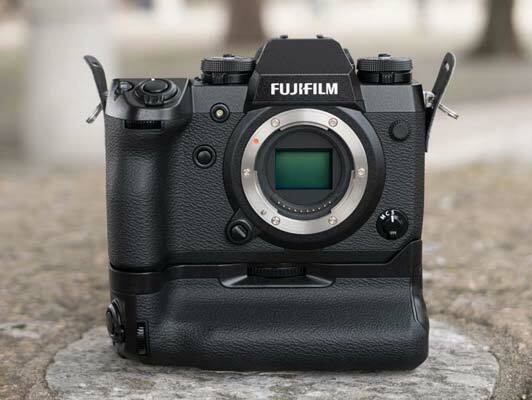 This is largely because of the need to accommodate the new in-body image stabilization system, a first for Fujifilm mirrorless cameras (more on this later). Compared to the XT2, the X-H1 is 166g heavier (623g vs 457g) and physically bigger in all dimensions, especially the depth thanks to the new chunky handgrip. While I really enjoyed the extra purchase that the new grip provides, being much more reminiscent of the grip on the Fujifilm GFX medium format camera, it does help to make the X-H1 an undoubtedly big mirrorless camera that won't be to everyone's taste if you naturally equate mirrorless with being small. In Fujifilm's defence, they've stated that the XH1 is a direct response to would-be owners wanting a bigger camera, and if you have larger hands then it will certainly appeal, but there's no denying that this new model is larger than many true APS-C DSLRs. You can see a size comparison between the X-H1 and several other camera systems here. Of course, you can turn to the X-T2 if you want a smaller camera, but obviously that no longer offers all the bells and whistles that the X-H1 has added, not all of which are to do with the larger format. Fujfilm have take the opportunity to beef up the build quality of the XH-1. The XH1's body is now made out of magnesium alloy that's said to be 25% thicker than on the X-T2, the surface of the camera's exterior coating is more scratch resistant, and the lens mount has been reinforced to be more resistant to damage. While I've never noticed any of these to be particularly problematic on previous X-series camera that I've reviewed, I guess they're nice to have on the new X-H1. The XH1 features exactly the same 24.3 megapixel APS-C size X-Trans CMOS III image sensor and X-Processor Pro image processing engine as the X-T2 and X-Pro2, so if you like the image quality that those two cameras offer (and we do), you'll still love what the X-H1 has to offer. The one new feature that will help improve the image quality in certain situations is the flicker reduction mode, which helps to deal with the vagaries of indoor fluorescent lighting when shooting at the higher burst rates that the X-H1 offers. 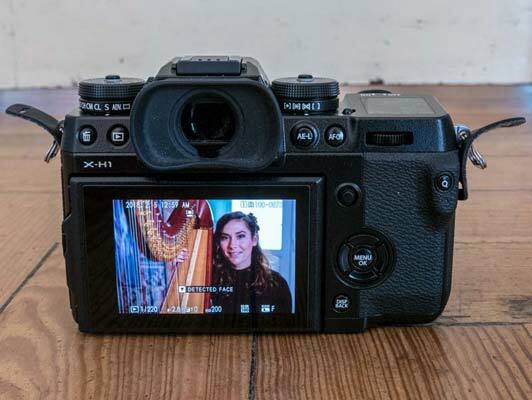 This is something that has long been a feature on Canon DSLRs, and we're glad to see it implemented on the X-H1, although note that it only works when using the mechanical shutter, not the electronic one. The brand new 5-axis in-body image stabilization (IBIS) provides 5 stops of compensation when used with the majority of XF lenses that don't already have any optical image stabilization functionality (actually 5.5 stops with the XF 35mm f/1.4 lens) and 3 stops with the more consumer-focused XC lenses. This excludes three XF lenses - the XF 10-24mm F4 R OIS, XF 18-55mm F2.8-4 R LM OIS and the XF 55-200mm F3.5-4.8 R LM OIS - which offer 2.5, 3.5 and 4.5 stops of compensation respectively. We've got a compatibility chart that shows all the Fujifilm lenses and how many stops of compensation they offer when mounted on the X-H1. In practice the new IBIS system worked very well with all the XF lenses that I tried it with, allowing me to hand-hold the camera down to some seriously slow shutter speeds and still achieve pin-sharp results. This is assisted by the new shutter shock absorption mechanism that's built into the top plate of the X-H1's shutter unit, which as the name suggests minimizes camera shake and maximises the effect of the new OIS system. 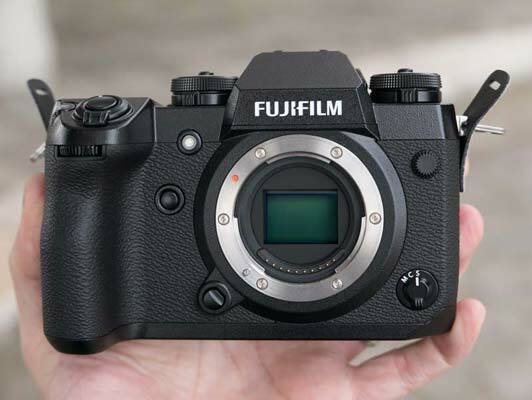 And if that wasn't enough, Fujifilm have also developed a "feather-touch" shutter button that the company claims further helps to reduce camera shake and also produces the quietest shutter sound of all cameras in the X series. While those claims may be true, I did find the shutter release to be overly-sensitive for the first few days of using the XH1, with more than a few mistakenly taken shots due to the shutter button being much more sensitive than on the other X-series cameras. After some practice, though, I grew to appreciate the lighter mechanism a lot more, so much so that I missed it when switching back to the X-T2. Note that the shutter button on the X-H1 is no longer threaded, unlike the X-T2, so you can't fit a traditional cable release. Another big change to the X-H1 when compared to the X-T2 is the addition of a 1.28-inch monochrome LCD screen to the top of the camera, just like on the GFX 50S medium-format camera. Fujifilm have taken advantage of the X-H1's bigger body and handgrip to offer this feature, but while it's undeniably very convenient to be able to check the camera's key settings with a quick glance at the top LCD, it's not all good news, as the X-T2's dedicated exposure compensation dial has been completely removed on the X-H1 (as it also was on the GFX 50S). Instead there's a far less convenient button positioned to the right of the shutter button, which you have to hold down then use the rear control dial to move the on-screen EV slider up and down to set the value. 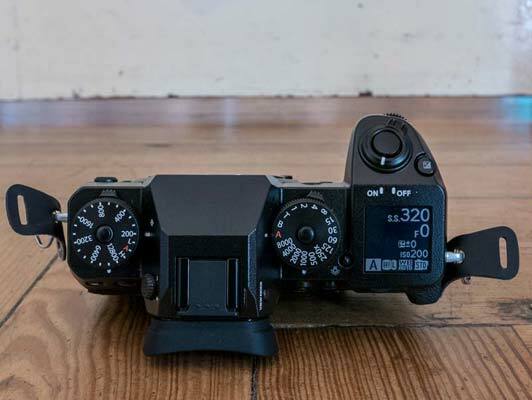 This is one change that I feel is a backwards step for the X-H1 - I would definitely choose a dedicated exposure compensation dial instead of the top LCD screen any day of the week. 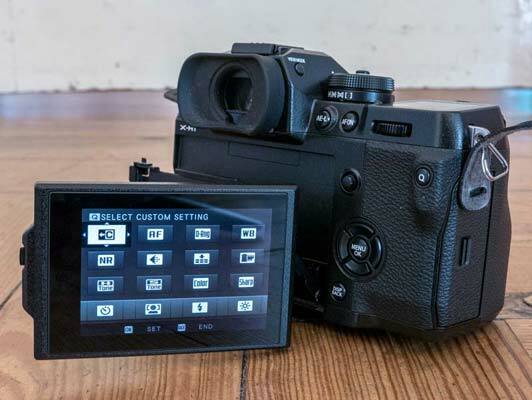 The 3-inch 1040K-dot LCD screen on the X-H1 is now touch-sensitive, which means you can use it to set the AF point or even fire the shutter release if you want when shooting stills or pull focus when recording video. On the right-hand side of the screen you’ll see a small icon, which if you press it allows you to choose between using the screen to set AF point, or to have it focus and then take a picture. If you prefer, you can turn off this functionality altogether, but it’s much quicker than using the buttons to set the point. Furthermore, you can actually change the focus point whilst holding the camera up to your eye by dragging across the touchscreen with your right thumb. Again, it's a little tricky to get it right at first, but persevere and it soon becomes more natural, if not quite second nature. 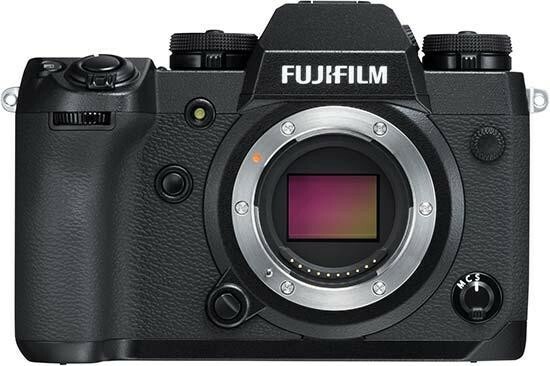 The auto-focusing system in the Fujifilm XH1 has been further improved in comparison with the X-T2. The phase detection AF now operates down to -1.0EV so that it's more reliable in very low-light, and it can be now used at an aperture of F/11 rather than F/8, which will please wildlife photographers who are using the 2x teleconverter with certain zoom lenses. Fujifilm also claim that the X-H1 performs more reliably when using the AF-C mode during zooming, although that's a very difficult claim to substantiate in practice without using an X-H1 and X-T2 side-by-side in the same shooting conditions. Note that these improvements work for both single point AF and Zone AF and apply to both stills and video recording. The X-H1 also improves on the X-T2's video capabilities, making it the best-specced X-series camera for video that's currently available. There's a brand new Eterna film simulation specifically for video recording. This is intended to be an emulation of cinematic film and is designed to provide pleasing colours out of the camera with no further need for colour grading during post-production. Whilst serious videographers will probably take advantage of the equally new internal F-log mode (only available on the X-T2 when using an external recording device) which essentially acts as a Raw file for post-production editing, the Eterna film simulation certainly provides a very pleasing look to video footage that many people will be pleased with, which helps to reduce the amount of time spent in front of a computer after a shoot. Other great new features include a DCI 4K shooting mode (4096×2160), a higher maximum bit rate of 200Mbps, and a 1080/120P high-speed mode, none of which the X-T2 offers. There's also a new higher quality built-in microphone (24bit/48khz) and timecode support, all of which help to make the X-H1 competitive with many of its main rivals. There is one serious drawback to the XH1, though, which may make videographers look elsewhere, and that's the fact that a couple of important features are only provided by fitting the optional VPB-XH1 vertical battery grip. Just like on the X-T2, fitting the battery grip to the X-H1 lengthens the possible recording time for 4K video from 10 to 30 minutes and also adds a 3.5mm stereo headphone socket, which isn't present on the X-H1 body. So to get all of the video features that you might need on the X-H1, you really have to buy and fit the VPB-XH1 grip, which as well as being an extra expense turns the X-H1 into a seriously big camera indeed. Notable improvements when comparing the X-H1 to the X-T2 include a much higher resolution electronic viewfinder (2.36 million dots on the X-T2, 3.69 million dots on the X-H1) which is 1.6x brighter than on previous models, a 2x faster eye sensor for switching between the viewfinder and the rear LCD screen, a dedicated AF-ON button positioned near your thumb on the rear of the camera which makes back-button focusing easier, and the welcome addition of Bluetooth LE connectivity. This allows you to transfer images from the camera to a smartphone, even if the X-H1 is turned off. Note that you must install the free "FUJIFILM Camera Remote" app on your smart device to use this function.